WooCommerce is a powerful e-commerce plugin that facilitates selling digital and physical products online. There are plenty of extension available for it, allowing you to add Bitcoin support and even let people pay their own price. The WooCommerce Donations plugin happens to be a handy extension that lets you accept donations using over 120 payment gateways. 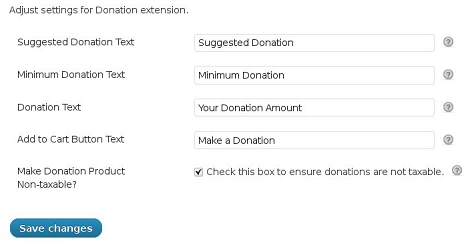 This plugin lets you set a minimum donation amount or suggest an amount to take the guesswork out of the process. Donations can be made non-taxable. The plugin lets you set custom labels for the product page. There is also a widget to show donations by year, month, week, or in total. WooCommerce Donations is fairly easy to use and lets you accept donations on your site. It also allows you to run reports to see who has donated. This is a premium plugin.